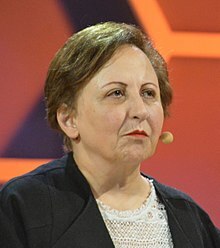 Shirin Ebadi (born 21 June 1947) is an Iranian lawyer and human rights activist. On December 10, 2003, Ebadi was awarded the Nobel Peace Prize, becoming the first Iranian and the first Muslim woman to receive the prize. In the last 23 years, from the day I was stripped of my judgeship to the years of doing battle in the revolutionary courts of Tehran, I had repeated one refrain: an interpretation of Islam that is in harmony with equality and democracy is an authentic expression of faith. It is not religion that binds women, but the selective dictates of those who wish them cloistered. That belief, along with the conviction that change in Iran must come peacefully and from within, has underpinned my work. Iran Awakening: A Memoir of Revolution and Hope, Random House, 2006, p.204. In my memoir, I wanted to introduce American women to Iranian women and our lives. I'm not from the highest echelons of society, nor the lowest. I'm a women who is a lawyer, who is a professor at a university, who won the Nobel Peace Prize. At the same time, I cook. And even when I'm about to go to prison, one of the first things I do is to make enough food and put it in the fridge for my family. From 2006 interview with Ebadi by New America Media editor Brian Shott (translator, Banafsheh Keynoush) about her newly released book, Iran Awakening: A Memoir of Revolution and Hope. I compare my situation to a person on board a ship. When there is a shipwreck the passenger then falls in the ocean and has no choice but to keep swimming. What happened in our society was that the laws overturned every right that women had. I had no choice. I could not get tired, I could not lose hope. I cannot afford to do that. From 2006 interview with Ebadi by Harry Kreisler (translator, Banafsheh Keynoush) about her newly released book, Iran Awakening: A Memoir of Revolution and Hope. I, who have defended many prisoners of conscience such as the seven imprisoned Baha'i leaders and others, would face unacceptable restrictions on my human rights work if I returned to Iran, if I were not arrested, now my own lawyer - who also represents many other activists - is detained, and her lawyer has been threatened with arrest for defending her. Where is the justice if your lawyer is arrested for defending you? About the arrest of Nasrin Sotoudeh. Iran: Lawyers' defence work repaid with loss of freedom. Human Rights Watch (1 October 2010). Archived from the original on 26 October 2012. Retrieved on 26 April 2011. This page was last edited on 11 July 2018, at 14:44.